“a play in which nothing happens, twice” wrote Vivian Mercer. It could be suggested that the play does not so much assert that Life is dull and meaningless as against actively make it so. Because precious little happens in the play, critics have often searched overly long for meaning. I think it’s just a mood piece. Perhaps that mood could be described as a type of playful pessimism. And such a mood clearly speaks to many, many people. Directly in front of me in the audience was a young woman wearing a Year 12 jersey. The caption printed on the back? ‘Bored’ – with the ‘o’ replaced by a smiley face. And this production by the Riverside Lyric Ensemble is certainly good fun. With a quality cast, director Cameron Malcher presents an entertaining show. 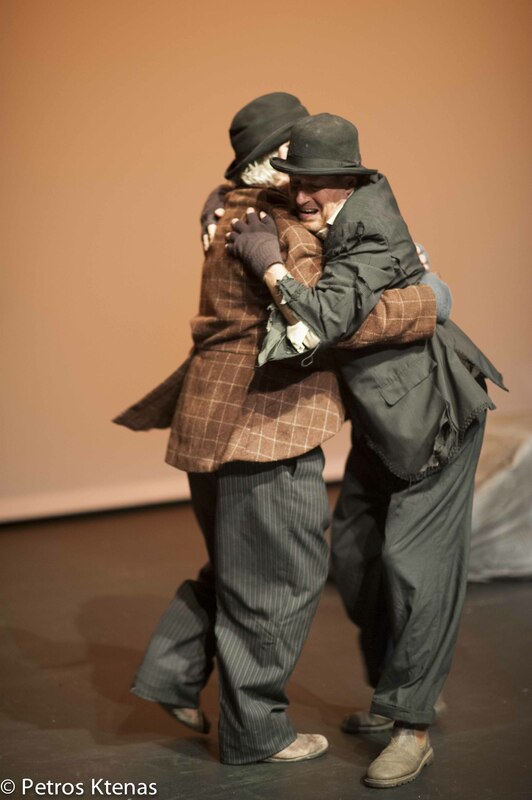 Errol Henderson and David Attrill play Estragon and Vladimir with humour and just the right touch of poignancy. Pozzo (Erica Brennan) and Lucky (Clive Hobson) are utterly engaging. Brennan has great fun with Pozzo’s imperious nature. And Hobson makes Lucky’s monologue the show stealer it’s meant to be. The staging is simple and beautiful. The play has powerful imagery (the tree, the boots, Pozzo’s rope – or is it Lucky’s?) and this imagery is allowed to do its magic. When first produced, Waiting for Godot was seen as something very new, and for this reason it’s been considered ground breaking. And, theatrically, it is. But in many ways, it’s one of the final gasps of a dying world view. The play’s sense that Life is depressingly without meaning is strangely quaint, based on the assumption that Life should come with its purpose pre-packaged.